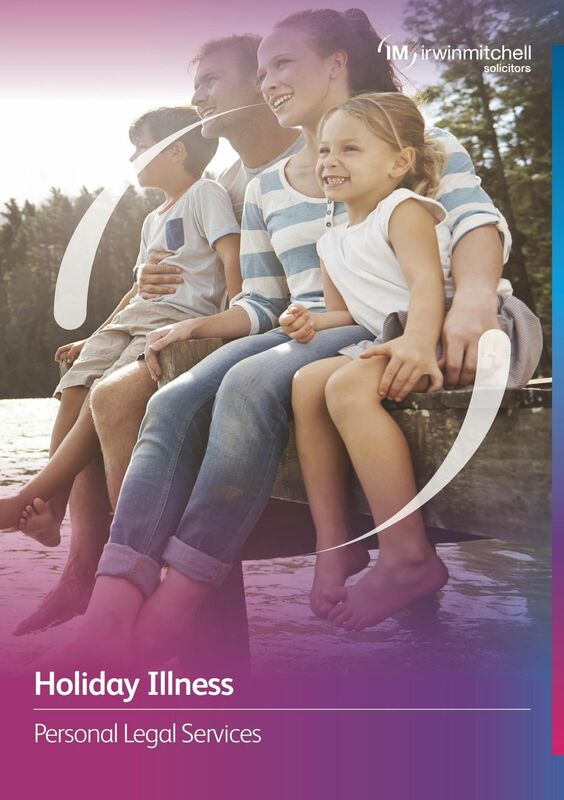 Download "Holiday Illness. 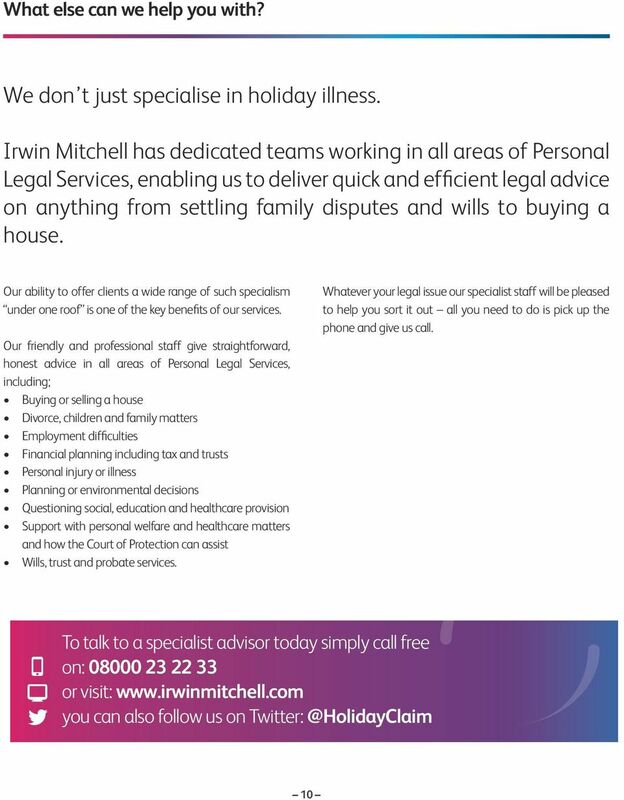 Personal Legal Services"
Holiday illness. Personal Injury. 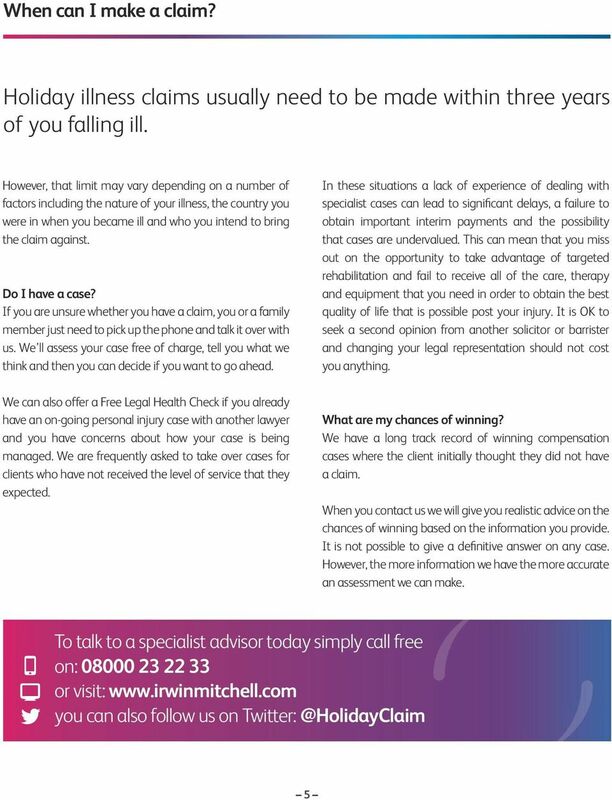 All you need to know about making a holiday illness claim from leading personal injury lawyers Irwin Mitchell. Accidents at Work Personal Legal Services This information relates to the law and procedures in England and Wales. Please contact us if you need advice about the law and procedure in other legal jurisdictions. Head Injuries Personal Legal Services This information relates to the law and procedures in England and Wales. Please contact us if you need advice about the law and procedure in other legal jurisdictions. Spinal Cord Injuries Personal Legal Services This information relates to the law and procedures in England and Wales. Please contact us if you need advice about the law and procedure in other legal jurisdictions. Work Related Illness. 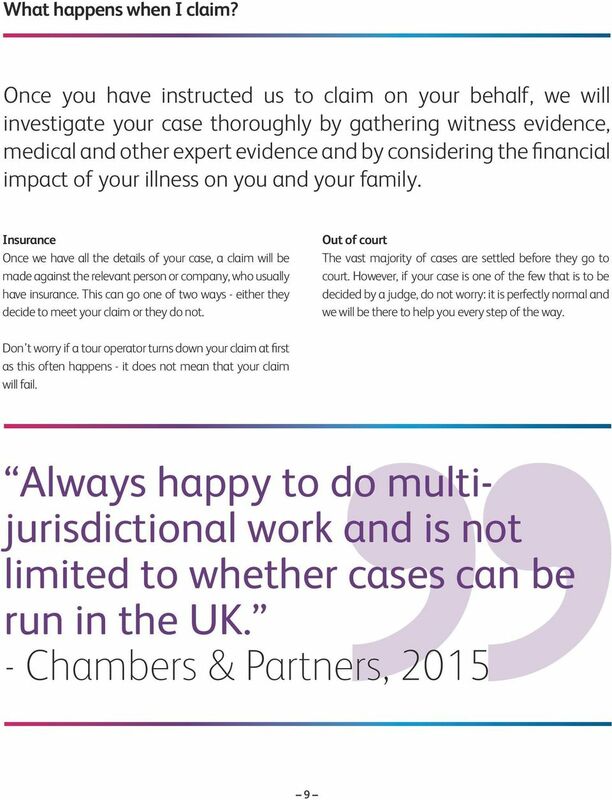 All you need to know about making a work related illness claim from leading personal injury lawyers Irwin Mitchell. Road Traffic Collision Personal Legal Services This information relates to the law and procedures in England and Wales. Please contact us if you need advice about the law and procedure in other legal jurisdictions. Medical Negligence Personal Legal Services This information relates to the law and procedures in England and Wales. Please contact us if you need advice about the law and procedure in other legal jurisdictions. Military Injuries Personal Legal Services This information relates to the law and procedures in England and Wales. Please contact us if you need advice about the law and procedure in other legal jurisdictions. Accidents at work. All you need to know about making a claim following an accident at work from leading personal injury lawyers Irwin Mitchell. Head injuries. Personal Injury. 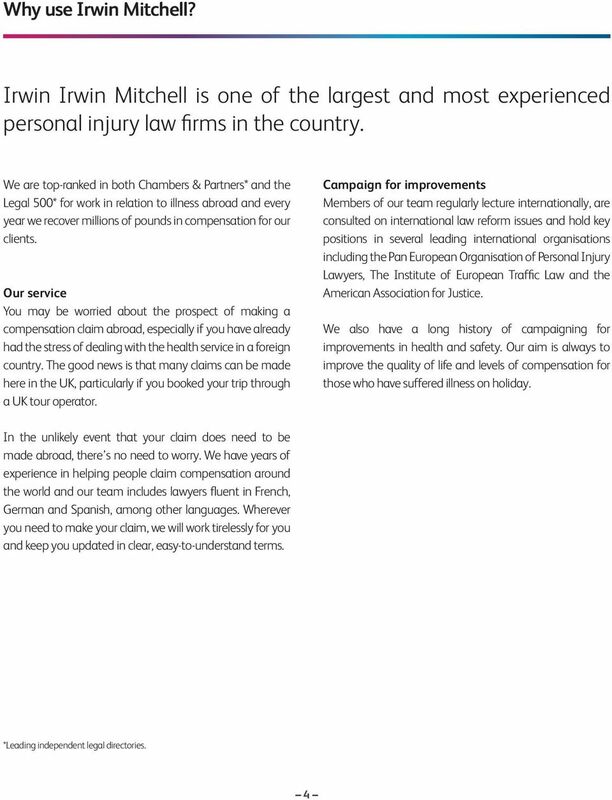 All you need to know about making a brain injury claim from leading personal injury lawyers Irwin Mitchell. WE RE HERE FOR YOU Expert local personal injury advice. Mesothelioma Personal Legal Services This information relates to the law and procedures in England and Wales. Please contact us if you need advice about the law and procedure in other legal jurisdictions. Spinal cord injuries. All you need to know about making a spinal cord injury claim from leading personal injury lawyers Irwin Mitchell. 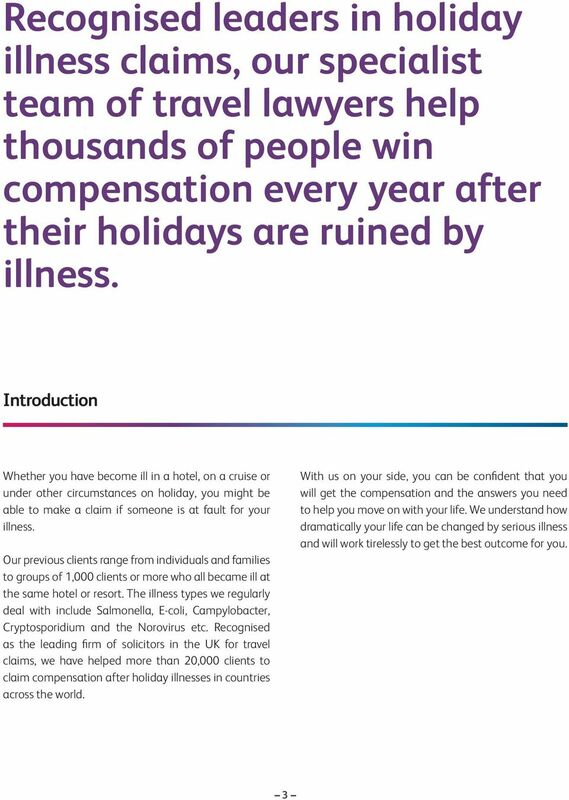 Brain injury: A guide to compensation Contents 1. Introduction 1 2. What is a brain injury? 2 3. How much compensation will I receive? 3 4. Medical care and rehabilitation 5 5. Funding your claim 6 6. 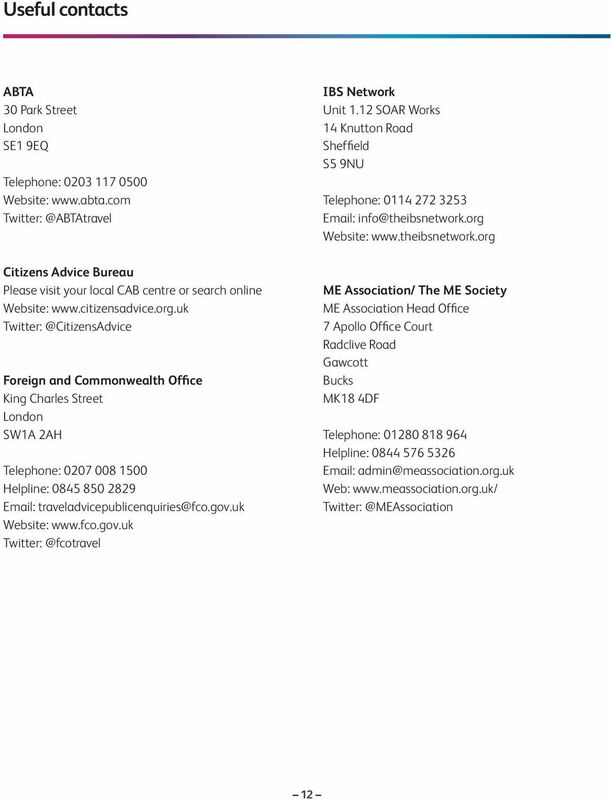 The independent scheme for Asda colleagues and families offering legal assistance, representation and advice. The independent scheme for Asda colleagues and families offering legal assistance, representation and advice. Contents Welcome to Lawclub 3 How can I use Lawclub? 3 What do I get as a member of Lawclub? Birth Injuries Personal Legal Services This information relates to the law and procedures in England and Wales. Please contact us if you need advice about the law and procedure in other legal jurisdictions. Mesothelioma. Personal Injury. All you need to know about making a mesothelioma claim from leading personal injury lawyers Irwin Mitchell. Mesothelioma Personal Injury All you need to know about making a mesothelioma claim from leading personal injury lawyers Irwin Mitchell. Thank you for managing my father s claim so quickly and efficiently. in partnership with Legal Services for Union Members in South Wales Freephone: 0800 3280394 union@watkinsandgunn.co.uk www.watkinsandgunn.co. Supporting today, enabling tomorrrow. www.braininjuryexperts.co.uk Taking the decision to make a claim is a big step, and it is important that you meet the people or person who may be handling your claim. I have legal protection insurance do I need to use it? 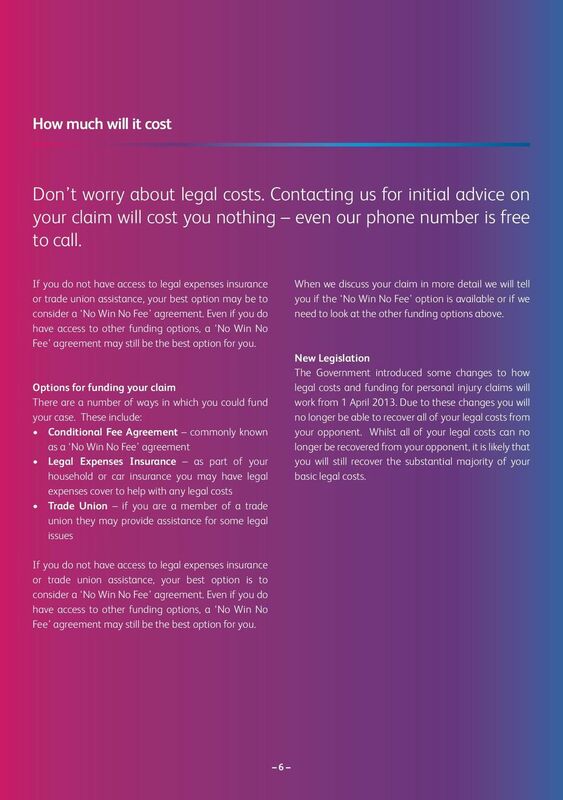 Legal Ombudsman January 2014 Consumer Guide: Costs Ten questions to ask your lawyer about costs 1 The information in this leaflet is useful for anyone who is using, or thinking of using, a legal service. 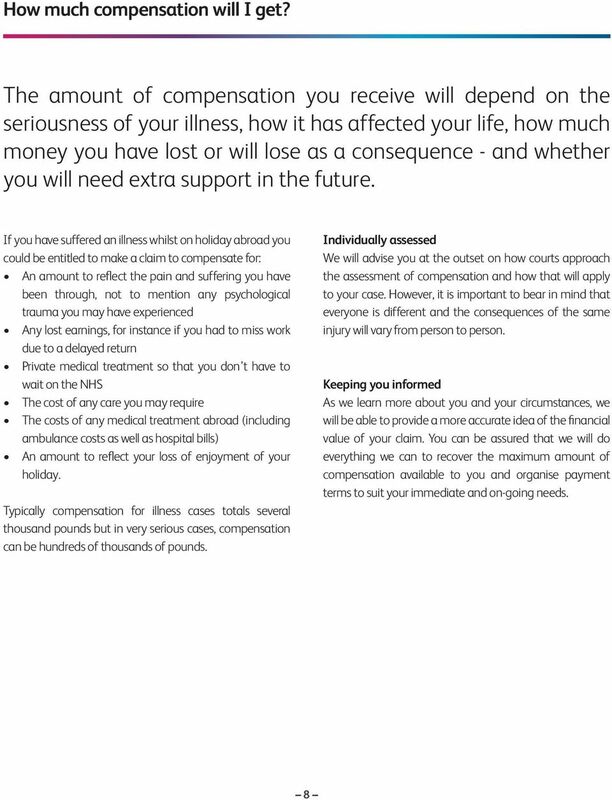 Conditional Fee Agreement ( CFA ) [For use in personal injury and clinical negligence cases only]. Medical negligence. 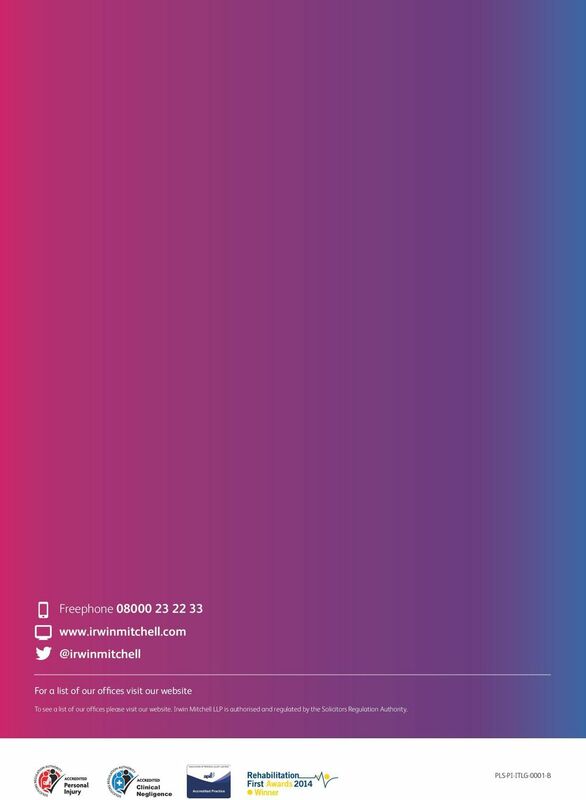 All you need to know about making a medical negligence claim from leading personal injury lawyers Irwin Mitchell. 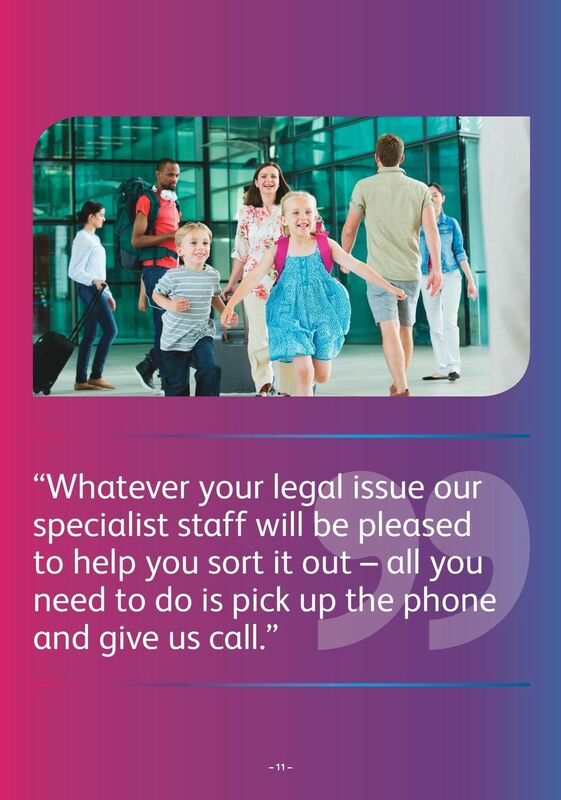 Legal Support Service South West. Support for life after childhood brain and other serious injuries. www.childbraininjurytrust.org. 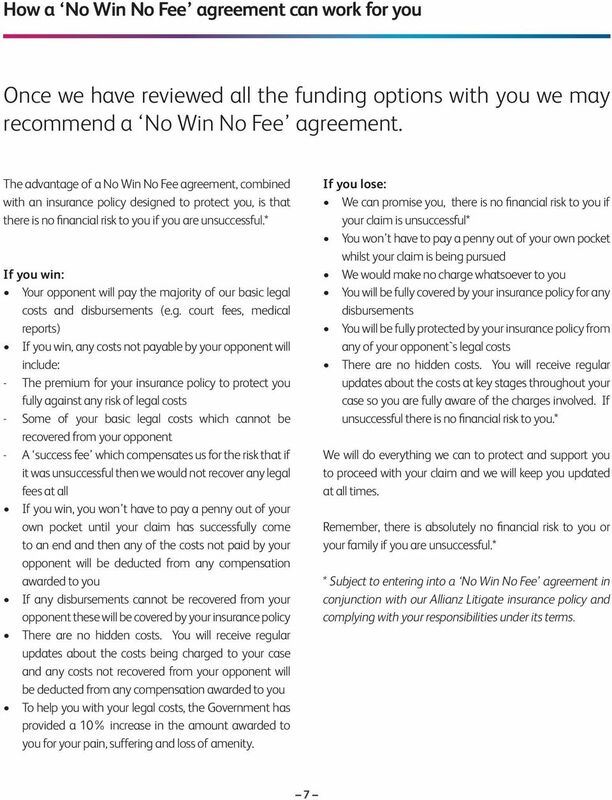 This agreement is a binding legal contract between you and your solicitor/s. Before you sign, please read everything carefully. A guide to debt recovery through a county court for small businesses. It could help you decide whether court action is right for you.